Norwich secured the League One title but were made to work hard for the win by a resilient display from Gillingham. After a goalless first half, Darel Russell opened the scoring in the 74th minute when he curled a shot over keeper Alan Julian from 25 yards. Although the ball was hooked clear by a defender, the referee awarded the goal as it had clearly crossed the line. And Michael Nelson netted his second goal in two games in the 82nd minute when he headed in Simon Lappin's cross. Well done for bouncing back to the Championship in style - hope you follow Leicester's example and waltz your way into the play-offs like wot we've done! Although Norwich had clinched promotion to the Championship last week with an away win over Charlton, a point at Carrow Road would have ensured second-placed Leeds were out of the running for the League One title. And the Canaries managed took all three points, albeit with a lethargic display. Gillingham had two excellent chances to score, but Dennis Oli failed to convert two one-on-one situations with goalkeeper Fraser Forster. "It'll probably sink in in the next few weeks when we get back here and win the trophy, which will be even better than it was today. "I'm looking forward to seeing the lads lift it. I'm looking forward to seeing people's reaction to it. "After so many years of barren times there's not many times you win something in your career so you may as well enjoy it while it's there." "We were good for 65 to 70 minutes, we had the best chance, we put in a good shift and to concede the first goal was a big blow. Up until then we looked good for the point. "Last time we were away we lost at Millwall and were awful then we played Brighton and Leeds and got four points so we have to go into next week and be positive and get the three points we want." 90:00+1:36 The official flags Dennis Oli offside. Direct free kick taken by Fraser Forster. 90:00+1:25 The ball is sent over by John Nutter, Michael Nelson makes a clearance. 90:00+0:07 Shot from long range by Chris Martin misses to the left of the net. 89:16 Michael Nelson concedes a free kick for a foul on Mark Bentley. Free kick taken by Alan Julian. 88:56 The ball is sent over by Darel Russell, clearance by Mark Bentley. 88:12 Inswinging corner taken left-footed by Simon Lappin, clearance made by Darren Dennehy. 87:15 The free kick is delivered right-footed by Darel Russell from right channel, Mark Bentley manages to make a clearance. 87:15 Booking Darren Dennehy receives a caution. 87:06 Unfair challenge on Korey Smith by Darren Dennehy results in a free kick. 84:49 Substitution Oli Johnson is brought on as a substitute for Grant Holt. 83:50 Shot by Chris Martin. Clearance made by Mark Bentley. Outswinging corner taken by Simon Lappin from the left by-line played to the near post. The ball is delivered by Michael Nelson, Jack Payne manages to make a clearance. 82:54 Substitution Simeon Jackson joins the action as a substitute, replacing Danny Jackman. 81:42 Simon Lappin provided the assist for the goal. 81:42 GOAL - Michael Nelson:Norwich 2 - 0 Gillingham Michael Nelson scores a headed goal from inside the six-yard box. Norwich 2-0 Gillingham. 80:05 Free kick taken by Fraser Forster. 80:05 Booking The referee cautions Michael Nelson for unsporting behaviour. 79:43 Free kick awarded for an unfair challenge on Michael Rose by Rene Howe. 78:13 Chris Martin takes a shot. Alan Julian makes a save. Simon Lappin takes a corner. 77:33 The ball is swung over by John Nutter, save made by Fraser Forster. 76:25 Free kick awarded for an unfair challenge on Mark Bentley by Chris Martin. Alan Julian takes the direct free kick. Correction - 75:22 Unfair challenge on Grant Holt by Jack Payne results in a free kick. The ball is crossed by Simon Lappin, Header from deep inside the penalty area by Gary Doherty goes harmlessly over the crossbar. 75:22 Free kick awarded for a foul by Jack Payne on Grant Holt. Simon Lappin crosses the ball, Header from deep inside the area by Gary Doherty goes harmlessly over the crossbar. 74:34 The ball is sent over by Dennis Oli, Headed effort from deep inside the area by Andy Barcham misses to the right of the target. 73:19 GOAL - Darel Russell:Norwich 1 - 0 Gillingham Goal scored by Darel Russell from just outside the area to the top right corner of the goal. 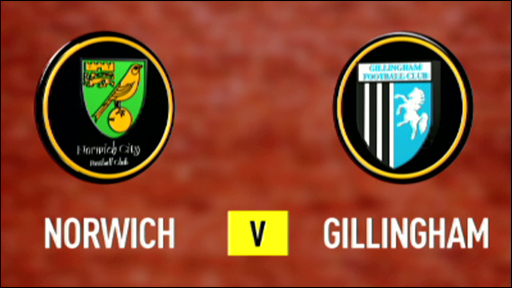 Norwich 1-0 Gillingham. 72:58 The ball is crossed by Simon Lappin, clearance made by Darren Dennehy. 69:15 Free kick taken by Gary Doherty. 69:15 Booking Curtis Weston receives a yellow card for unsporting behaviour. 69:05 Curtis Weston challenges Darel Russell unfairly and gives away a free kick. 68:15 Foul by Curtis Weston on Simon Lappin, free kick awarded. Free kick taken by Darel Russell. 67:34 Centre by Darel Russell, save by Alan Julian. 65:38 Substitution Stephen Hughes goes off and Simon Lappin comes on. 65:38 The ball is crossed by Chris Martin, Close range headed effort by Stephen Elliott goes wide of the left-hand upright. 64:23 Grant Holt has an effort at goal from the edge of the box that misses to the right of the target. 63:16 Stephen Hughes challenges Curtis Weston unfairly and gives away a free kick. Free kick taken by Jack Payne. 60:16 Darren Dennehy concedes a free kick for a foul on Grant Holt. Free kick crossed by Stephen Hughes. 58:50 Shot from outside the box by Danny Jackman goes wide right of the target. 58:42 John Nutter crosses the ball, clearance by Michael Rose. 57:13 The referee blows for offside against Stephen Elliott. Direct free kick taken by Alan Julian. 56:44 Dennis Oli has a drilled shot. Save made by Fraser Forster. 55:46 Corner taken left-footed by Danny Jackman to the near post, Michael Rose manages to make a clearance. 54:45 Adam Miller fouled by Chris Martin, the ref awards a free kick. Free kick taken by Mark Bentley. 54:08 Michael Spillane sends in a cross, clearance by Jack Payne. 53:15 Andy Barcham produces a curled right-footed shot from deep inside the penalty box which goes wide of the left-hand upright. 52:39 Unfair challenge on Adam Miller by Korey Smith results in a free kick. John Nutter restarts play with the free kick. 51:18 Free kick awarded for an unfair challenge on Adam Miller by Stephen Hughes. Free kick taken by Adam Miller. 50:16 Curtis Weston gives away a free kick for an unfair challenge on Chris Martin. Free kick taken by Darel Russell. 48:37 Dennis Oli takes a shot from 12 yards. Fraser Forster makes a save. 46:42 Effort from deep inside the area by Chris Martin misses to the left of the goal. 45:24 Free kick awarded for an unfair challenge on Korey Smith by Danny Jackman. The free kick is swung in right-footed by Darel Russell, clearance made by Jack Payne. 45:01 Substitution Stephen Elliott comes on in place of Anthony McNamee. 42:08 Rene Howe fouled by Michael Nelson, the ref awards a free kick. Free kick taken by Adam Miller. 39:46 The referee blows for offside against Darel Russell. Mark Bentley takes the direct free kick. 38:49 Chris Martin is ruled offside. Alan Julian takes the direct free kick. 36:45 The ball is crossed by Rene Howe, save made by Fraser Forster. 34:45 Free kick awarded for a foul by Darel Russell on Curtis Weston. Free kick crossed right-footed by Adam Miller, save by Fraser Forster. 33:45 Korey Smith challenges Curtis Weston unfairly and gives away a free kick. Alan Julian takes the direct free kick. 30:22 A cross is delivered by Michael Rose, Mark Bentley manages to make a clearance. 27:44 A cross is delivered by Anthony McNamee, clearance made by Jack Payne. Corner taken left-footed by Anthony McNamee to the near post, Andy Barcham makes a clearance. Darel Russell has an effort from just inside the box that misses to the left of the goal. 27:21 Centre by Michael Rose, clearance made by Darren Dennehy. 22:26 Michael Rose challenges Curtis Weston unfairly and gives away a free kick. Adam Miller crosses the ball from the free kick right-footed from right channel, Gary Doherty manages to make a clearance. 21:30 Adam Miller is ruled offside. Fraser Forster restarts play with the free kick. 21:14 Free kick awarded for an unfair challenge on Dennis Oli by Gary Doherty. Danny Jackman takes the direct free kick. 20:07 Foul by Michael Spillane on Andy Barcham, free kick awarded. Alan Julian takes the direct free kick. 18:42 Corner taken by Adam Miller from the left by-line, Chris Martin manages to make a clearance. 17:20 Effort from close in by Chris Martin goes wide left of the target. 14:35 Unfair challenge on Grant Holt by Mark Bentley results in a free kick. Strike on goal comes in from Chris Martin from the free kick. 13:39 Rene Howe delivers the ball, save by Fraser Forster. 12:00 Free kick awarded for a foul by Darren Dennehy on Grant Holt. Direct free kick taken by Stephen Hughes. 11:00 Foul by Gary Doherty on Curtis Weston, free kick awarded. Free kick taken by Adam Miller. 8:47 Outswinging corner taken by Anthony McNamee, Michael Nelson challenges Mark Bentley unfairly and gives away a free kick. Direct free kick taken by Alan Julian. 8:14 Anthony McNamee produces a cross, clearance made by Darren Dennehy. 6:40 The ball is crossed by Michael Rose, save by Alan Julian. 3:17 Grant Holt fouled by Mark Bentley, the ref awards a free kick. Darel Russell delivers the ball from the free kick right-footed from left channel, clearance made by Curtis Weston. 2:21 Unfair challenge on Michael Spillane by Darren Dennehy results in a free kick. Michael Spillane takes the direct free kick.